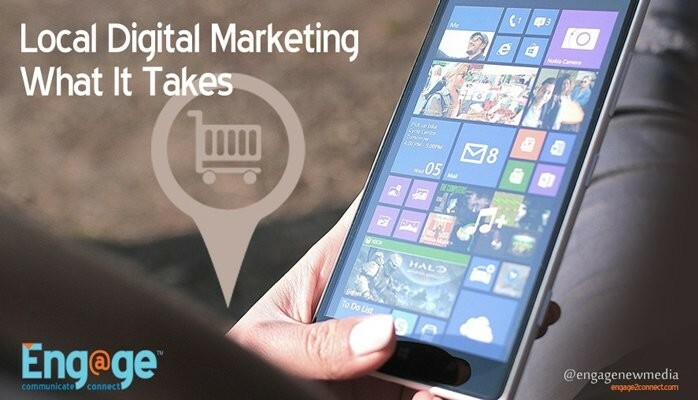 Recently we have had several conversations with some of our current and prospective retail customers across the country about their digital marketing. In these conversations it was apparent that many local businesses are not aware of the numerous moving parts and considerable effort required to be effective online. When it comes to digital marketing, what you don’t know can and will hurt your local business, so understanding its components, how they work together and what is really required on a daily, weekly and monthly basis is incredibly important. Many small businesses today are struggling to break through the noise online. The challenges, knowledge and resources needed to drive online traffic is in short supply for many small business owners, yet without significant improvements in this area they are continually losing ground to both national and local competitors. Add to these challenges frequent changes by search engines like Google, the nuances of email marketing and the ever increasing competitive social media landscape, and it leaves most local businesses really struggling to keep up. In order to help you understand some of the numerous components involved with an effective online marketing strategy, we are going to detail one of our clients programs. Though every client is different and requires customized strategies, platforms and resources, this will give you a good idea of the time and activity required, let alone the knowledge and experience needed to begin seeing significant results. Using one of our local clients as an example, we found that not only did they have to combat the local competitive businesses within search, content marketing and social media visibility, but they also had to fight off big corporate brands (box stores and wire services) in their marketplace. This is a weekly chess match that has to be combated and won on a very local playing field. Here are only a few of the components that must be managed on a daily, monthly and weekly basis for this sample client. The below are actual numbers, however it is important to understand that there are several additional layers and activities that are not included in order to keep it short, but we think you will quickly see the amount of time and resources that went into being effective online as a local retailer. 1) Social Media Marketing – With this client the focus is on Twitter, Facebook and Instagram. List Growth/Management: We manage the client email list as well as a focused daily campaign to grow the list size. Through all other channels, as well as specific website development and management, there are daily activities that are required to see this happen effectively. Campaign Creation/Deployment: Every month we design a completely custom email campaign. This involves 4-5 custom graphic elements, along with professional copy writing and campaign promotional strategies. 3) Content Marketing – We develop text, graphics and video content for this client almost daily. The created content is for all platforms from social, the website and paid advertising campaigns. 4) Website & Store Management – We manage all elements for this clients in their website development, and monthly management on their eCommerce store, etc. 5) Search Marketing – We manage this clients organic and paid ad marketing for search. In the above example of a real client’s integrated digital marketing program, we are just touching on the top level requirements. We have not gone into the required tools and their costs, the industry research regarding continual changes in each of these areas, or the strategy sessions we go through to execute for our clients. We have also left out Yelp, Google Business, Stumbleupon, Digg, Tumblr, Reddit, Delicious and other media channels that must be monitored and managed to ensure all other components we have listed are effective. You would also need to add the amount of time a business owner would need to spend without experience to manage all of this. It can become a huge drain of your time! Many times businesses or their marketing agencies don’t like to talk about results. But at the end of the day, that is what matters, so it can’t be ignored. Results are what drives the growth of your business, so for us we want to discuss results all day long. – Focused use of local keywords in optimization which resulted in 81% in new sessions on the site from organic search. – In one local paid campaign the impressions from strategically created and placed paid ads were 2,628 which contributed to driving page views to the site of 15,000 visits which doubled from the year prior. – Increasing returning visitors to the site by 10%. – Increasing organic traffic to the site by 200%. – Email open rates reaching 39% with a higher than average retail click through rate. Our methodology is based on well thought out proven strategy to execute our clients digital marketing that gets real results. All of the components listed above must be combined with a defined strategy that leads your customers down a short but well placed path to purchase (the funnel). It is not a few hours per week or even per day that achieves results, but an integrated dance of time, experience, knowledge and tools that all work together.